When you think of sushi what do you think of? Japan, trendy restaurants?, RAW FISH? When I talk to my friends or family about sushi most of them say that they do not really like it, when I ask why the main response is usually that they dont like fish. 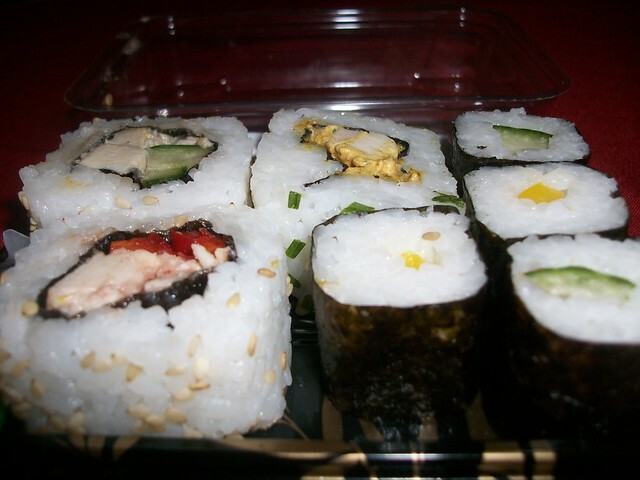 Well what a lot of people do not know is that fish is not always an ingredient of sushi. Which was why when I was in my local supermarket today it was nice to come across this. This is a chicken and vegetable take on their fish recipie, I have tried the fish one and it is quite good. It’s not as good as anything you would pick up at a good sushi resuraunt but for a lunch time snack it is a very good substitute. It comes with teriyaki chicken, coronation chicken. cucumber, peppers and plain chicken. All in all a great meal for anyone that wants to try the great tast of sushi but does not like fish. 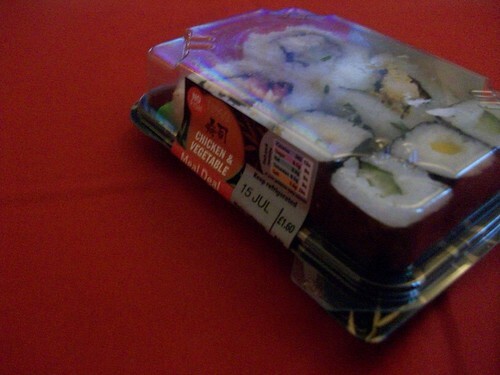 Posted by theloveofjapan on July 14, 2011 in Food, Photos, Uncategorized and tagged food, sushi. 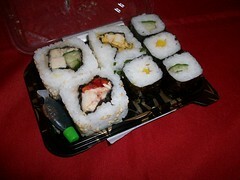 it was the tesco one, yeah i saw on the packing that it said no raw fish on the fish one i was so confused. i dont know why they do that.